At this time of year temperatures increase and so do the amount of leaving parties. Expat society is very transient and one of the downsides of being an expat is friends have to leave. Take a look in any coffee shop at this time of year and you will see groups of women sipping lattes, deep in conversation about what would be the best present to buy for the friend that is leaving. So Expat Echo Dubai have decided to help these ladies cut down on their coffee consumption and have come up with a list to help them make the best and most original choice. The Ghaf Tree is a symbol of the UAE and the desert. It was often the only source of nutrition and medication in the desert, and so this ancient tree has thus earned much love and respect. So much so that Sheikh Zayed passed a law forbidding the cutting down of Ghaf trees and schools and children have been named after it. For US$5 you can buy a Ghaf Tree seedling that will be planted and when it has grown big enough, will be planted back into the community where shade is needed. Throughout the year they have planting ceremonies and you may go and help plant the trees. There is no limit on the amount of seedlings you can buy and this gift will not only be a memorable present of your friend’s time in the UAE but will also be helping to protect one of the world’s most valuable symbols of the living desert. Send your friend out of the back of a plane to jump (tandem!) 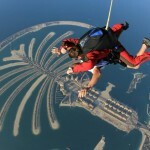 over one of the most breathtaking views in the world – The Palm Jumeirah. This may not seem the obvious present to give a favourite friend but trust us, when they do it they will love it. Not only will they hold the memory forever, they will also receive a DVD of the whole event from putting the gear on, sitting (nervously) inside the plane, the jump and finally the landing. If you can’t see your friends ever jumping out of a plane how about a trip in a sea plane? Seawings offers many flights over Dubai including a 40 minute tour over the city, flying over iconic sites such as The Palm Jumeirah, The World Islands, The Burj Khalifa, the historic Dubai Creek, Port Rashid and Burj al Arab. Despite the age of computers people still love to flick through the pages of a photo album. So why not give your friends a forever keepsake that they can look at for years to come. Collate photos from friends of the leaver’s time in Dubai and put them together in a photo book. WordArt which create items including unique photos of the region’s iconic views, structures and architectural features shaped into words. 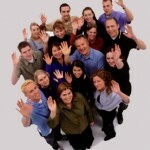 They can also tailor make orders for first names and surnames as well as brands and company names. Also available are ready-made words including DUBAI, LOVE, PEACE, DREAM, HAPPY and SMILE. Other great gifts include a range of embellished canvasses and a great new range of textile art which are fab for gifts too!! Peas in a Pod are a group of artists specialising in unique cut-out artworks. Hand-made and three-dimensional, the artworks draw on iconography of local culture. 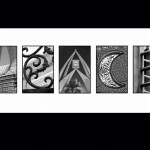 Representing 12 images from around Dubai and 12 images from around Abu Dhabi, the new series of mounted prints have been specifically compiled to show the best and the most dramatic scenes of the United Arab Emirates. Gallery One which has shops all over town also have a great collection of prints of iconic Dubai scenes that make great presents. 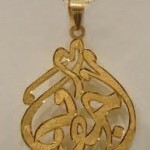 A lovely gift for the ladies is a pendent of their name in Arabic script. Asrar Jewellery located in the Mercato Mall and Ibn Battuta Mall produce beautiful silver pendents in a tear-drop shape. For the men, they also do cufflinks or book-marks in silver. Not actually a museum but more Ali Baba’s cavern, filled to the brim with Arabic trinkets for little reminders of Dubai, whether its a paper weight, Arabic man and woman salt and pepper shakers or a mosque disguised as an alarm clock! They have it all. Banyan Tree Al Wadi is the first desert resort in the United Arab Emirates to offer a concept with integrated facilities, comprising spacious all-pool villas, 3,999 sqm of Asian-inspired hydrotherapy spa facilities, a dedicated nature reserve and a private beach. Individual private luxury suites based on the “Bedouin Tent” which are nestled within a green and verdant oasis amongst some of Arabia’s most impressive dune and desert landscapes. A truly luxury desert experience. Experience unparalleled luxury and comfort amid the mystic desert charm of Abu Dhabi’s Empty Quarter. Every room, villa and suite is considered to be some of the finest abodes among luxury Abu Dhabi resorts and features desert views, blending rich interiors with the landscape. 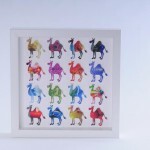 And finally… you can’t let your friends leave Dubai without a Camel so why not buy them a real keepsake Camel from Camel Caravan who offer a selection of beautiful camel miniatures. 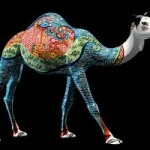 These high quality figurines can be purchased at various outlets in Dubai and the UAE. 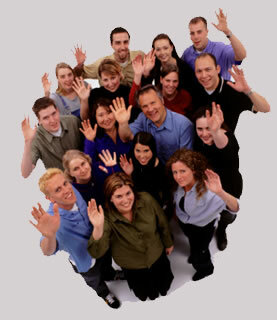 It’s a busy time for parties so if you’re planning to throw your friend a leaving party with catering, book in advance. Check out our Outside Party Caterer’s Directory.